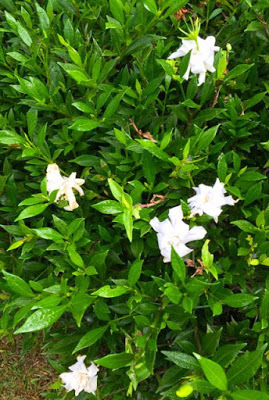 Gardenias – Which One to Plant and How to Care for Them? 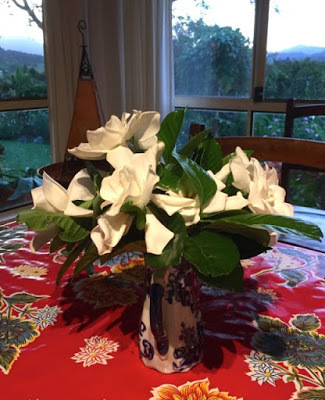 WHAT: Gardenias are rightly among the most popular plants in Australian gardens (they certainly are in mine – I have four varieties) grown especially for their glorious white, perfumed flowers and evergreen, glossy leaves. 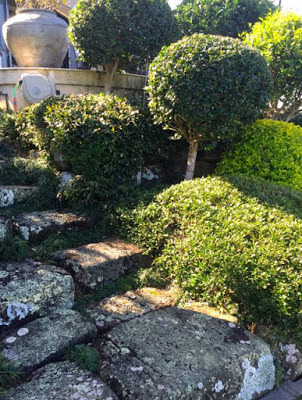 The added bonus, for us gardeners, is that they come in a variety of heights and shapes – which means that there is one for every spot in the temperate garden, making them among the most useful of landscaping plants. Gardenia radicans The lowest growing of the gardenias that rarely gets above 50cm. which makes it very useful for edging, borders, rockeries and courtyards. The leaves are small, pointed (narrow elliptic) and evergreen. It flowers profusely – mostly in November and December with fragrant irregular white blossoms. TOP TIP: The radicans part of its name means ‘with rooting stems’ which means that it is very easy to propagate this variety from its side stems which readily throw out roots – you simply cut off the rooted stem and plant it. Gardenia augusta This is a medium sized shrub – more wide than tall 2m x 1.5m.and a great evergreen ‘filler’ for the sub-tropical garden. The most common varieties are ‘Professor Pucci’ and ‘Florida’ (a variety of which is a ghastly thing called ‘Golden Magic’ the flowers of which turn from their gorgeous creamy white to a sickly yellow as soon as they open). 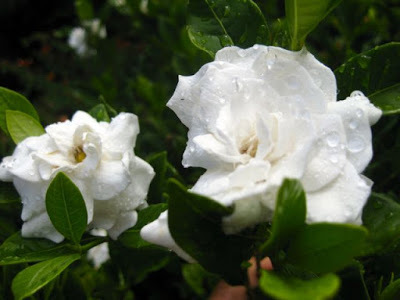 Known as the ‘florists gardenia’ augusta makes a wonderful cut-flower and has an extended flowering season, throwing out blossoms throughout the summer with it’s peak through November and December. Leaves are small and a lustrous dark green that are paler beneath. It’s easy to keep this plant small, but it does require regular pruning. Gardenia magnifica The queen of the gardenias. 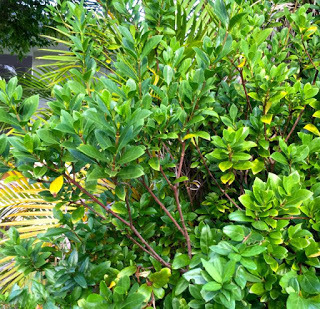 A taller shrub, which will get to over 2m if you let it, with glossy leaves and the most beautiful matt-white perfumed flowers. It doesn’t flower as profusely as the other varieties, with its main flowering time before Christmas. I find that they prefer a little less light – happy in the morning sun with filtered light in the afternoon, whereas the radicans and august as will tolerate full sun – but not the hot afternoon sun from the west. A couple of months before I took the above photo of this Gardenia magnifica in my garden, it was over 2m tall and looking pretty sick – leaves turning yellow and falling leaving mostly bare stems. I couldn’t find any sign of pests or diseases. What did I do? Cut it right back, fed mulched it and hoped for the best – and now you can see the results of what a bit of TLC will do? TOP TIP: I am writing about gardenias now because, while they have their main flowering flush in early summer, they will keep popping out the odd flower throughout the warmer months . They have just had their last dash so NOW IS THE TIME TO PRUNE THEM – late autumn to early winter. Big mistake people – don’t let the stems get long and leggy like this one in the above photo, PRUNE THEM – and don’t do it when most people do, in spring, because you will be cutting off the developing flower buds. Because gardenias flower on the current seasons’ growth you will get more flowers if you prune them because pruning creates a multitude of side shoots that increase the flowering potential. 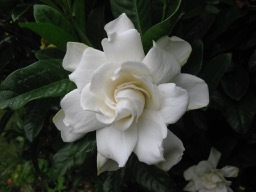 The above photo shows a Gardenia augusta in my neighbour’s garden (sorry Dixie!). What do you think this plant is crying out for? 1. A haircut – note the leggy, bare stems. and 2. A feed – note the pale, yellowing leaves and 3. A good layer of mulch. COMMON PROBLEMS: There are two reasons why gardenias do so well is the sub-tropical garden and both are related to their origin – they come from the sub-tropics, from the edge of pine forests with inherently slightly acidic soils – as are ours (5.5-6pH) – so generally they are going to be quite happy in conditions that mimic their place of origin: a warm frost free spot, humidity and a slightly acid, rich soil. Without this they may struggle – round pegs and square holes people! 1. Plant generally pale green with yellowing leaves – (not to be confused with NORMAL winter yellowing of some lower leaves) If you look at the plant in the above picture, you will notice an overall pale green colour with quite a few yellow leaves. 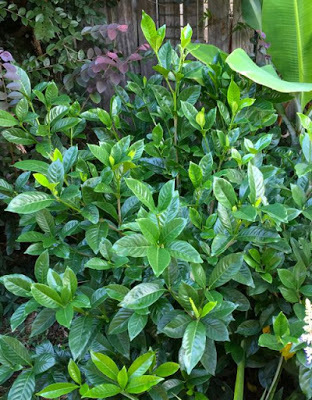 SOLUTION: Give the plant a dose of Epsom Salts (magnesium sulphate) – gardenias quickly become deficient in magnesium, mulch it (they like cool roots) and feed it at least three times a year with a slow release organic fertilizer. 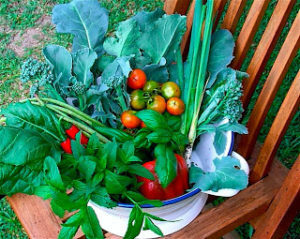 All of this will correct any pH problems and feed the soil with all the nutrients that these plants require. 2. 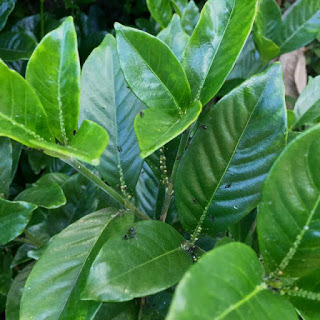 Scale and sooty mould – the waxy dots on the mid-rib of these gardenia leaves is a SCALE – a SAP SUCKER and a common pest of gardenias. Note the ants all over the leaves. ANTS and SCALE live in a symbiotic relationship – clever critters! The ants give the scale a piggy back to a new plant (scale can’t fly), to feed off honey-dew that is exuded by the scale after it has sucked the life out of the new leaves, leaving them weakened and unsightly. If you have noticed a BLACK SOOTY coating on the leaves – this is a mould (that gets transported in the air) that lives off any excess HONEYDEW after the SCALE and ANTS have had their dinner. SOLUTION: A simple, non-toxic, home-made eco oil – don’t reach for the spray can!! (Click here for the whole story about SAP SUCKERS and how to control them). Just mix this up in a spray bottle, give it a good shake and spray on affected areas – this smothers the scale – problem solved. Repeat as necessary. 3. 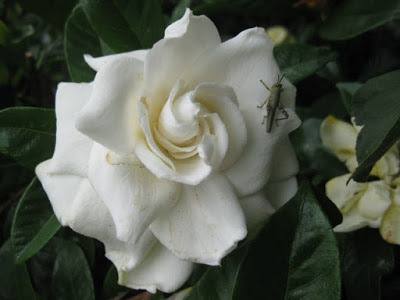 Bud worm – damage to the growing tips of the plants and flower buds can be caused by a wide range of winged insects that lay their eggs on the gardenia and when they hatch the larvae (caterpillars) eat the juicy new bits. I had noticed this recently on most of my gardenia bushes with tell-tale chewed shoots and leaves and webbing all over the growing tips. 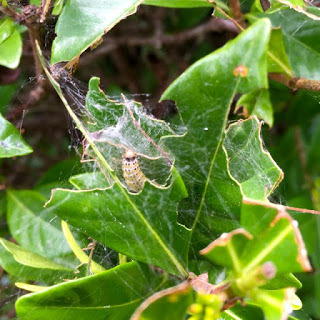 SOLUTION: I am reluctant to reach first for any kind of control of garden insects, knowing that infestations are usually indicative that the plant is under stress – they are a bit like us, when we are run-down we get sick too. Importantly, I didn’t know how this critter fits in to the life cycle of other species. 1. First of all I tried pruning all the bushes and cutting off the affected areas. 2. When some persisted I sprayed the affected areas with Dipel – a non-toxic biological control of caterpillars. 1. Gardenias are relatively easy to propagate from semi-hardwood, leafy tip cuttings with a heel of older wood – in other words, a stem tip that is not entirely green and beginning to turn brown. Cuttings are best taken in autumn and winter – makes sense to do it after you have pruned them – you have lots of propagating material! – and strike in a mixture of sand and compost. For a detailed explanation of how to do this, go to this link. 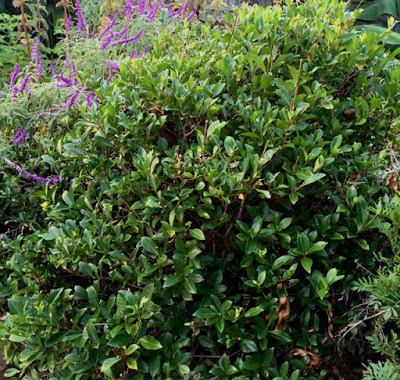 I have four magnifica bushes in my garden, all growing from cuttings from of a bunch of gardenias I received about 12 years ago – it’s that easy! 2. Refer to Gardenia radicans. Their ability to throw out roots from side shoots is not unique to this little fella – all gardenias will do it. Simply find a side shoot close to the soil, weigh it down with a stone, or peg it with a piece of wire, cover in nice moist soil and mulch and leave for a few weeks. When it has grown roots, you simply cut off that stem and plant it. You’ve got to love a plant that is named after a chap named Garden? Carl Linnaeus, the Swedish botanist (1707-178) and father of binomial nomenclature – the bloke who set about naming all plants and animals in a standardised and logical way – named the gardenia to honour Alexander Garden (1730-1791) – a Scottish physician and amateur plant collector who left his chilly homeland for the southern states of the USA where, I suspect, he saw gardenias for the first time and fell in love with them too?